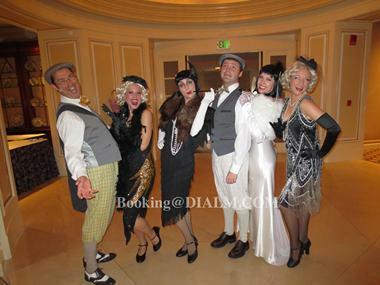 Dial M Productions is Los Angeles' premier entertainment event planning company for interactive events.We are LA's longest running Murder Mystery Show. The show begins with a “Get Acquainted Before You Die Party” where the actors pose as guest. From the moment you meet the Mistress of Murder the plot begins to thicken. We will set up the guests of your choice as suspects. They are framed and become part of the show. In between the courses of dinner the plot twists leaving everyone more suspicious than ever. Over dessert you’ll have the opportunity to solve the mystery. Detective Riley helps your guests piece together the clues to solve the mystery, and those who do will win a prize! A perfect mixer for all social occasions. What a great way to get the party going! Murder Mystery and Mayhem - Dial M Murder Mysteries Since 1985. Dial M Murder Mysteries Since 1985!